A former husband of actress Diana Dors, Dawson was 79. Born in Gosport, Hampshire, he played Corporal Peter Newkirk in World War II comedy Hogan's Heroes for six years. He became a panelist on TV show Match Game before hosting Family Feud for 10 years. Family Feud was copied in the UK under the name Family Fortunes. His son Gary wrote on Facebook on Saturday: "It is with a very heavy heart that I inform you that my father passed away this evening from complications due to esophageal cancer. "He was surrounded by his family. He was an amazing talent, a loving husband, a great dad, and a doting grandfather. He will be missed but always remembered." After starting his career as a stand-up comedian, Dawson married the English pin-up Dors in 1959. The couple settled in California but he was devastated when she walked out on him and they divorced in 1967. By then, he was known as the Cockney prisoner of war in Hogan's Heroes, which ran on CBS from 1965 to '71. He became Family Feud's host when it launched on the ABC network in 1976 and won a daytime Emmy Award in 1978 for best game show host. 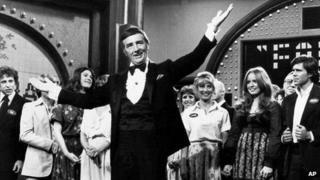 At its height, Family Feud was one of the most popular programmes on US TV, airing 11 times a week - five in daytime and six in the evening. Known for giving the female contestants a kiss, he met his second wife Gretchen when she appeared on the programme with her family in 1981. He left the show in 1985 but returned for one further series in 1994. Not afraid to play on his TV persona, he appeared as the ruthless game show host Damon Killian alongside Arnold Schwarzenegger in the 1987 film The Running Man.